I have been dancing around the interwebs all week with each new character sketch that the endlessly talented Phantom Rin unveiled in the STALKING JACK THE RIPPER universe, and wanted to do a round-up for anyone who may have missed out on the fun. Rin just shared some new illustrations with me, so keep an eye out on Facebook, twitter, tumblr, and instagram if you’d like to see them the day they’re posted. I’ll also post and share them on my accounts as well. Gah! I’m so in awe of the way she captured the essence of each character. I’ll try and emerge from the writing cave to do another round-up post next week. “Wield your assets like a blade, Cousin. No man has invented a corset for our brains. Let them think they rule the world. It’s a queen who sits on that throne. Never forget that. There’s no reason you can’t wear a frock to work, and don the finest gown and dance the night away. But only if it pleases you.” – Liza, STALKING JACK THE RIPPER. Official summary + Title reveal + Giveaway! Oh. My. Goodness. I’ve been DYING to share the new title with you. Luckily, today is that day! To make things even MORE AWESOME?! I also get to share the official summary. HUZZAH! Now…without further ado, I present my brand new title. OF BLOOD AND SHADOW is now called…. I absolutely LOVE it and sincerely hope you do too. I think it perfectly expresses my strong female lead, and how far she’s willing to go to in order to solve this case. Gah! I HAVE ALL THE EXCITEMENT! Now…on to the goodies… Since Audrey Rose writes forensic notes and has anatomical drawings in her journal, I’m giving away a Victorian-inspired journal that I’ve handwritten a STALKING JACK THE RIPPER quote in. I’ve also included a vintage key necklace, anatomical drawings, and have signed the back cover. To enter, simply click on the Rafflecopter link below. You can enter/tweet about it once a day until March 3, 2016 to rack up bonus entry points! Oh! And guess what else???? If you’d like to send your future self a present in time for Halloween reading–and, seriously, who doesn’t like future presents? 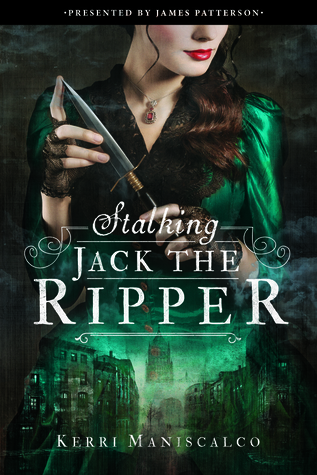 !–you can totally pre-order STALKING JACK THE RIPPER now. STALKING JACK THE RIPPER will be available in stores and online on September 20, 2016.